A pool of 153 cities, authorities and regional commissions which are members of the GMA Georgia Municipal Employee Benefit System (GMEBS) Life and Health Insurance Fund—underwritten by Blue Cross Blue Shield of Georgia—are eligible to apply for these annual awards. Members win the award, called the Health Promotion and Wellness Incentive Grants, based on their commitment to staff health and demonstrated collaboration with other community groups and organizations engaged in health promotion. As part of the grant process, the City has again designated Turner as Health Promotion Leader to develop a workplace health promotion action plan and attend Local Government Risk Management Services' (LGRMS) High Impact Health Promotion and Wellness training session. Turner encouraged Avondale Estates to apply for the grant when he began working for the City in 2008. 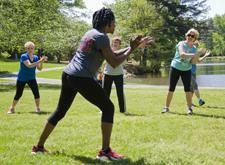 Since first receiving the award in 2009, the City’s wellness program has grown from a 13-week to a year-round endeavor. Last year, the City used some of its grant money to purchase a Fitbit Flex (activity- and sleep-tracking wristbands) for each participating associate. City staff waged “Walk Wars” against each other, competing for the highest number of steps per week, along with office bragging rights. Associates also enjoyed monthly wellness classes taught by DeKalb Medical nutritionists and trainers. The program’s success has been spotlighted in the media: Since 2013, the Atlanta Business Chronicle has lauded Avondale Estates as a top-10 healthiest employer in its size category. Again this year, associates will be offered a confidential health assessment with a blood pressure screening and health improvement feedback. Turner will also be promoting Blue Cross Blue Shield of Georgia’s 24/7 NurseLine and LiveHealth Online—a phone line and a video chat app, respectively—which can immediately connect an under-the-weather associate to a nurse or doctor from the comfort of the associate’s home. Wellness programs have a demonstrated track record of improving associate health and quality of life, reducing medical claims and improving workplace morale. GMA offers wellness services to all member cities through LGRMS, a nonprofit agency operated jointly with the Association County Commissioners of Georgia. Pictured with this story: City associates and residents attended the City's April 2015 Exercise Break by the Lake, led by DeKalb Medical trainer and fitness professional Patrice Peters. Inspiration for the community event, held during Georgia Cities Week, came from the City's year-round Wellness Program.